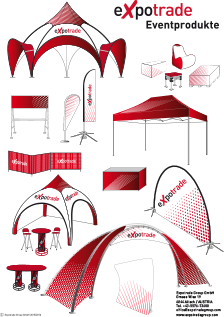 The bartables from expotrade – the expobartable and the expotwin – are the ideal bartables for your event. This table consisting of 3 parts is easily put together and known for its high stability. The steel-ring at the bottom of the product can be powder coated in various colours. This part of the expobartable serves as footrest and also as weighing down. The round center column can be fully labeled and because of its large diameter this means a perfect possibility for advertising. Additionally, the Werzalit-tabletop is fully printable, easy to clean and also resistant against burning ash. In order to make it also possible to sit at this table, expotrade offers the expobarchair as an accessory for the expobartable. The optional parasol hole on the table allows a further special attachment. You can easily put a parasol through the hole which makes the product on the one hand more practical and on the other hand it creates also a even better eyecatcher for your advertisement.